This is fun. The monster isn’t under your bed… the monster is your bed. 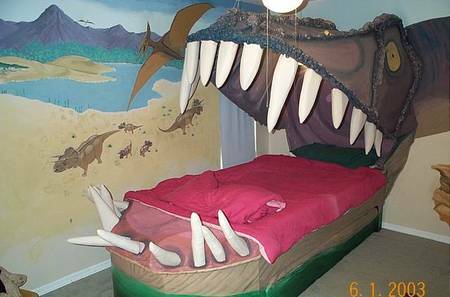 If you are a child who loves dinosaurs and doesn’t get terrified by the thought of sleeping in the jaws of a tyrannosaurus rex, this would be the most amazing bed in the world. In a way, it’s just a take on the classic four-poster bed with awnings, except with fangs instead of the four poster bits. Full marks for creative parenting here. 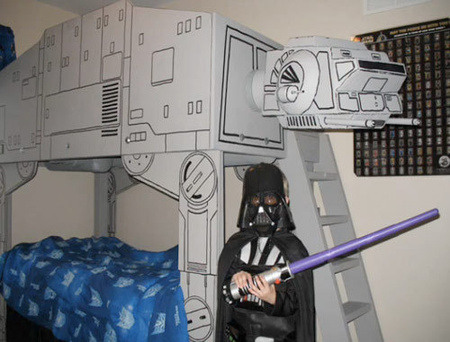 While we’re on home-made beds – honourable mention to this Star Wars creation below as found on click4beds. That’s some serious skillz with MDF on display.